Rally your friends, family, and colleagues to join and celebrate this monumental day for women. 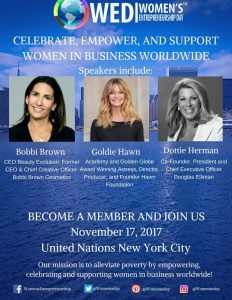 Spend the entire day at the United Nations and become inspired by powerful speakers with exceptional ideas and remarkable anecdotes, which is the soul of Women’s Entrepreneurship Day. While each speaker is unique and arrives from different industries or backgrounds, all share the same goal – to empower women in business! To find out more about the WED 2017 event, speakers and programs visit Women’s Entrepreneurship Day!